The rugged Torngat Mountains straddle the Quebec/Newfoundland boarder on a narrow peninsula between the Atlantic Ocean on the east and Ungava Bay on the west. The mountains here have a stark, desolate beauty that is usually accentuated by unsettled weather (Torngat means “place of the devil” in Inuktitut). Access to these remote peaks is difficult and the climbing season is short. The highest peak, first named Mont d’Iberville by the Topographic Commission of Quebec, was first climbed in 1973. When it was determined that the highest point was actually on a ridge inside Newfoundland, it was given a second name, Mount Caubvick, by the Newfoundland Geographic Board. And so it is that the highest mountain in eastern Canada south of Baffin Island has two names. The mountain is now within the recently created Torngat Mountains National Park Reserve. The difficulty of Mt. d’Iberville/Caubvick is best compared to that of Granite Peak, Montana. Some rock climbing skill is needed, and bad weather is a constant challenge. The most common access to the Torngats is now from Nain, Newfoundland by boat – Cruise Newfoundland & Labrador, and Cruise North Expeditions. Air charters can also be arranged from Nain and from Kangiqsualujjuaq (no joke! ), Quebec. It used to be possible to land just south of the mountain on a gravel bar along the Koroc River, but that option vanished when First Air ceased flying Twin Otters in 2002. Now that access is only by boat or floatplane, the best route to the summit is the route of first assent, the Minaret Ridge. 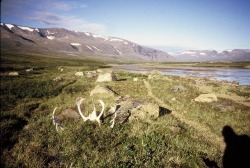 The route begins where the McCornik River enters Nachvak Fiord. Put ashore on the east side of the broad river delta created by the McCornik River. Ascend the east bank of the McCornik River, crossing several brooks along the way. These brooks are less intimidating in the morning when less meltwater is present. Ford the McCornik River somewhere below Cirque Brook, and make camp on the tundra along the river, about 6 miles from the fiord. From here the summit is 5 miles away. Follow d’Iberville Brook through gentle caribou pastures to the Minaret Glacier, and onto the Minaret Spur. Climb the Minaret Spur to its intersection with the Minaret Ridge, and the Minaret Ridge to the summit of Mont d’Iberville. Rock climbing on the Minaret Ridge has been rated only 5.2, but an occasional belay may be needed as the ridge is very exposed, and crowned with many pinnacles and gendarmes. From Mont d’Iberville, the “summit” of Mount Caubvick is reached by walking about 30 ft north into Newfoundland territory. Downclimb the Minaret Ridge and Minaret Spur, and follow d”Iberville Brook and the McCornik River back to Nachvak Fiord for pickup. Caribou will be your companions on this hike, as well as possibly wolves and black bear. Polar bear sightings along the fiord are unlikely but not impossible.